Emanyata Secondary School (ESS) is located in the small village of Ololosokwan, bordering the Serengeti National Park. Founded in 1992 by Maasai activist Moringe Parkipuny, the school was originally designed to give Maasai students an education while maintaining traditional values and a focus on pastoralism and agriculture. PWC has been managing Emanyata Secondary School since the Aigwanak Trust handed us control in 2006. In response to the improvements made by PWC, in 2011 the Trust requested PWC run the school for a further 20 years. Because it is a community school, ESS has the freedom to admit more typically disadvantaged students, many of whom have not been accepted to local government schools. ESS aims to provide a quality education as well as to increase the number of female students enrolled in school. Over 65% of students are girls making it unique among secondary schools in the district. As it is a boarding school girls are away from home and therefore better able to resist family pressure to drop out of school to marry. It is now the top performing school in the district, many of the 200 students are sponsored by us. Providing these children, both boys and girls, with an education will lead to a more informed pastoralist community, capable of protecting their rights and traditions while at the same time adapting to modernity and globalization with dignity. The school possesses a shamba (farm) and a herd of livestock. 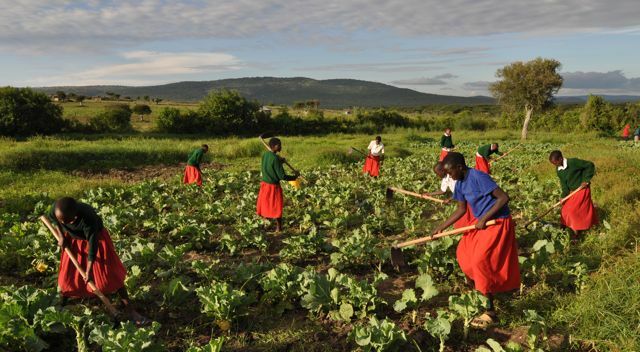 Students maintain both the shamba and the livestock; in this way, they balance class work with traditional labour. ESS students have already gone on to advanced secondary school, college, and university, obtaining degrees. Many pastoralist students who have completed higher education have come back to aid the community with their newfound knowledge and experience.